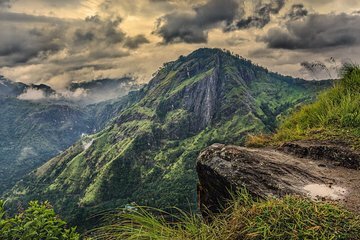 Experience bird’s-eye views over Sri Lanka’s tea country on a private guided hike to Ella Rock. Leaving from Ella with a personal guide to show the way, ascend past tea plantations and forests to the rock top, perched above a steep drop. Enjoy the incredible, far-reaching panoramas over valleys, hills, and peaks from here before your trip ends back in Ella in time for breakfast (own expense). A low-to-medium difficulty morning hike. Meet your guide in Ella early, and after an introduction to what’s ahead, begin your walk. Wear a hat and comfortable shoes, and bring water for the round-trip hike. You may also want to bring salt or lime to help deal with any leeches on route. Trek past fields, plantations, and lush jungle, and drink in the silence and scenery. Then, on reaching the trail head to the rock, follow the path upward. As you ascend, admire the surrounding tea plantations and watch as the tea pluckers head out to pick the leaves. Climb higher through farmsteads and forests of rubber trees, and after a sharp bend, reach the summit — where a rocky ridge above a steep drop commands breathtaking views. Take time to absorb the stupendous panoramas stretching over Sri Lanka’s hills and plains. The best views come with the morning — when you visit — as the rising sun illuminates the green valleys and distant peaks. Snap plenty of photographs and then enjoy the scenery again as you descend with your guide. Your hike finishes in Ella in time for you to have breakfast independently (own expense).